Opportunity comes quickly. There's a deadly new plague in Africa, and it is devastating the countryside and cities. President Torrent declares American solidarity with the victims, but places all of Africa in quarantine until a vaccine is found or the disease burns itself out. And he sends Captain Bartholomew Coleman, Cole to his friends, to run the relief operations and protect the American scientists working on identifying the virus. If Cole and his team can avoid dying of the plague, or being cut down by the weapons of fearful African nations, they might do some good. Or they might be out of the way for good. 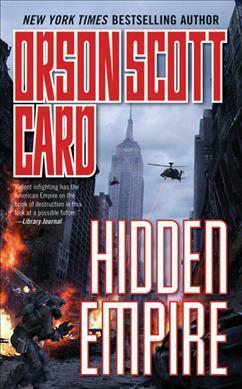 Orson Scott Card is the author of the novels Ender's Game, Ender's Shadow, and Speaker for the Dead. Ender's Game and Speaker for the Dead both won Hugo and Nebula Awards, making Card the only author to win these two top prizes in consecutive years. There are seven other novels to date in The Ender Universe series. Card has also written fantasy: The Tales of Alvin Maker is a series of fantasy novels set in frontier America; his most recent novel, The Lost Gate, is a contemporary magical fantasy. Card has written many other stand-alone sf and fantasy novels, as well as movie tie-ins and games, and publishes an internet-based science fiction and fantasy magazine, Orson Scott Card's Intergalactic Medicine Show. Card was born in Washington and grew up in California, Arizona, and Utah. He served a mission for the LDS Church in Brazil in the early 1970s. Besides his writing, Card directs plays and teaches writing and literature at Southern Virginia University. He lives in Greensboro, North Carolina, with his wife, Kristine Allen Card, and youngest daughter, Zina Margaret.